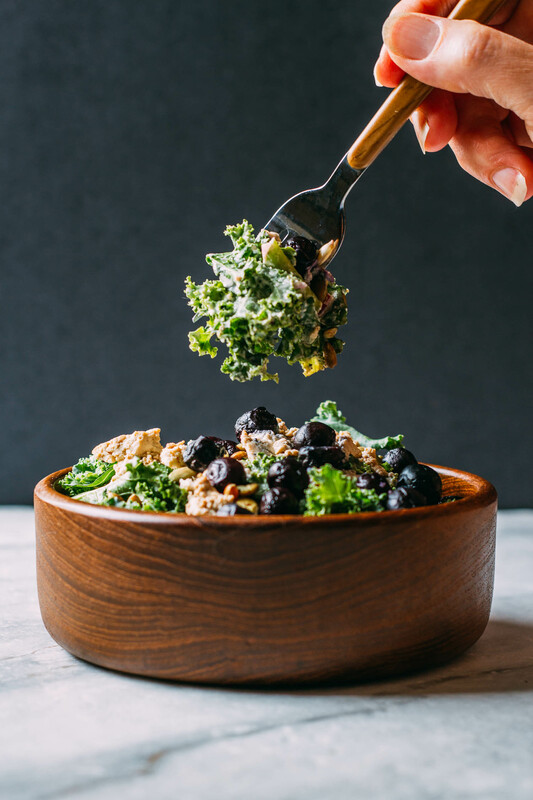 From the juicy little blueberries all the way to the gently massaged and impeccably dressed kale, Blueberry Kale Pumpkin Seed Salad is spectacular. In fact, these dark leafy greens and berries dressed in Creamy Tahini Citrus Dressing are not like anything you’ve ever tasted. Just wait until you experience the tasty bits of protein-packed marinated tofu strewn throughout this lovely bowl of nutrients! And do you know that there’s a little secret to making tofu taste lovely? Tofu that tastes fabulous is all about pressing. You press the excess packing liquid out of the tofu before you add seasoning to it. Pressing the tofu first allows it to absorb the full flavor of its marinade. The pumpkin seeds can be pan toasted or left raw, that’s entirely up to you. Neato! This salad is the ideal dish to make when you don’t feel like turning on the stove. Now about those gorgeously plump blueberries. Blueberries, as you likely know, are fabulously nutritious. Blueberries are high in antioxidants and help fight cancer! Additionally, blueberries amp up weight loss, boost brain health, alleviate inflammation, and support digestion. Not a bad resume for those little round blue balls of juice! Also, I recently learned that eating blueberries positively affects artery function. In this video clip, Dr. Michael Greger of NutritionFacts shares precisely how many blueberries you should eat to experience maximum artery benefit. And here’s a remarkable little fact to remember: frozen organic blueberries are often more affordable! Furthermore, frozen blueberries are just as nutritious as fresh! And after viewing Dr. Greger’s informative clip for the first time, I promptly went grocery shopping. Have you ever been so motivated by what you learned that you intentionally went to the store to purchase a particular item? Well, I have! Off to the store for frozen blueberries, I went! In fact, that video inspired me to write this delicious recipe. Food is our medicine. I smiled ear to ear when preparing the nutritional content breakdown for this recipe. This baby is loaded with good stuff! 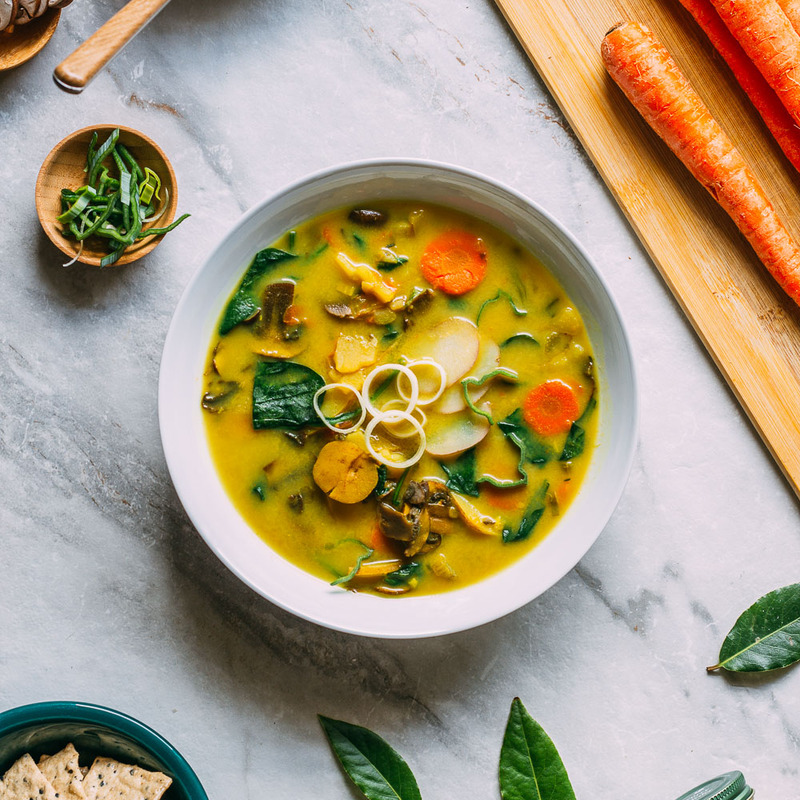 Be sure to take a good long look at the rich nutrients listed at the bottom of this recipe. Additionally, the unique flavor combo of this delightful bowl is nothing short of addicting. 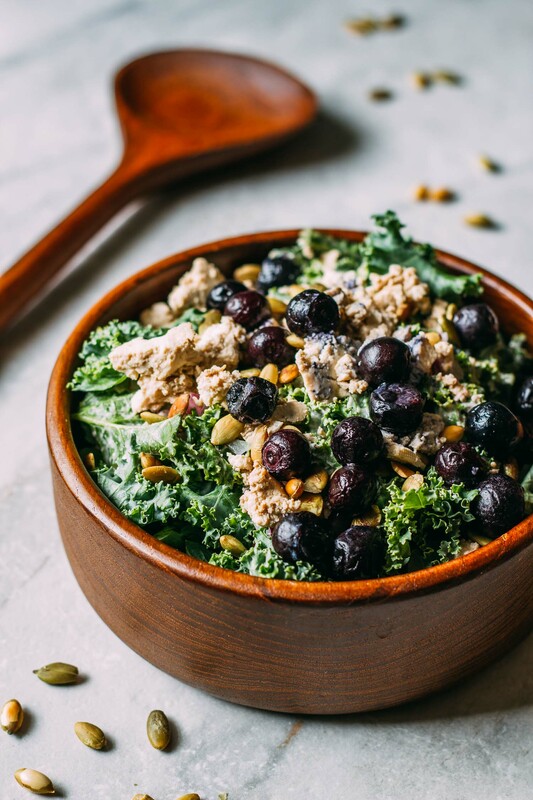 The tahini dressed kale coupled with juicy blueberries and earthy flavored tofu make my mouth water just writing about it. And finally, once you sink your teeth into your first bite, this hearty salad will become a favorite, I’m sure! 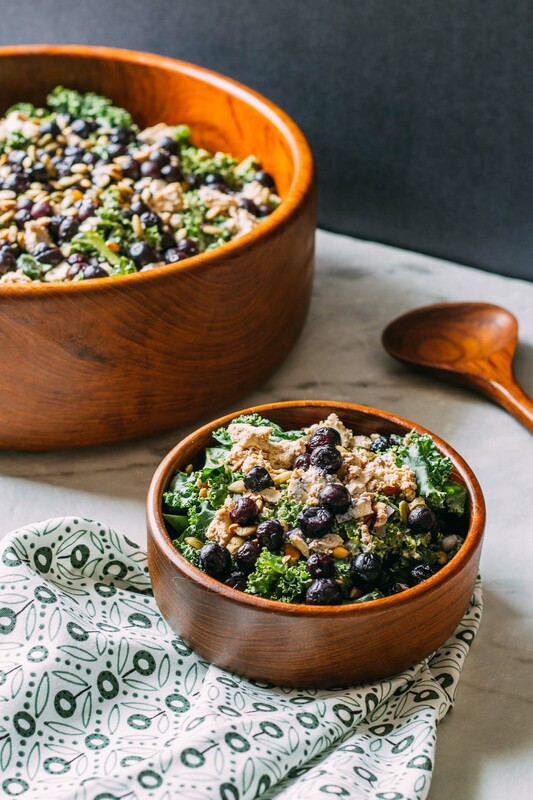 This Blueberry Kale Pumpkin Seed Salad is nothing short of spectacular! So be sure to Pin this recipe for safe keeping and easy sharing! All I can say about Blueberry Kale Pumpkin Seed Salad is you’ve got to try it, try it, try it! And take a moment to taste its loveliness with your eyes first. 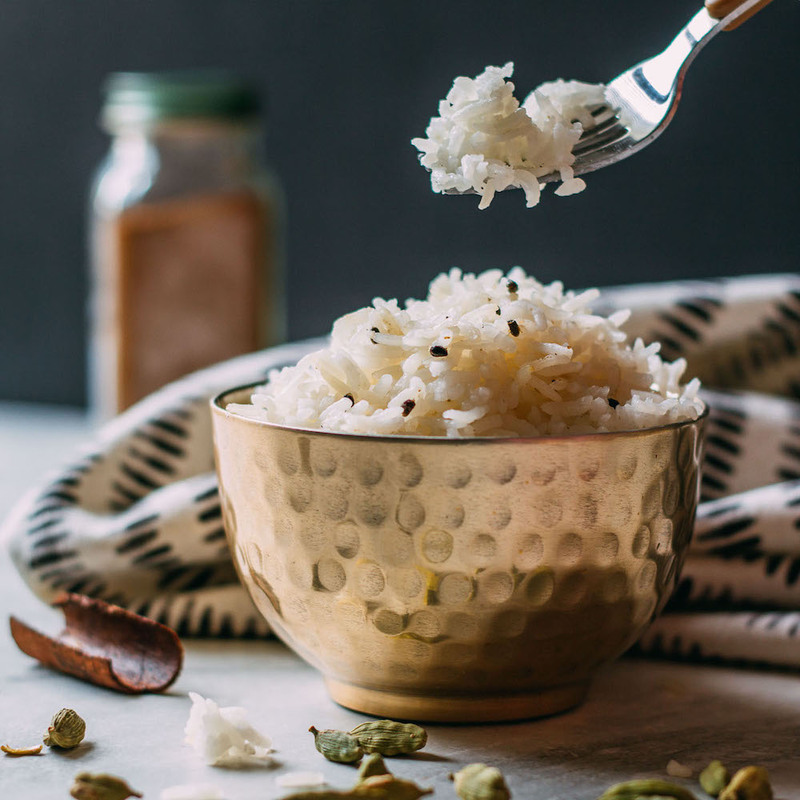 Believe it or not, this beautiful bowl is remarkably quick and simple to prepare. It’s the perfect warm-weather salad because even toasting the pumpkin seeds is optional. If you’d like, you can keep the stove off for the day – yay! 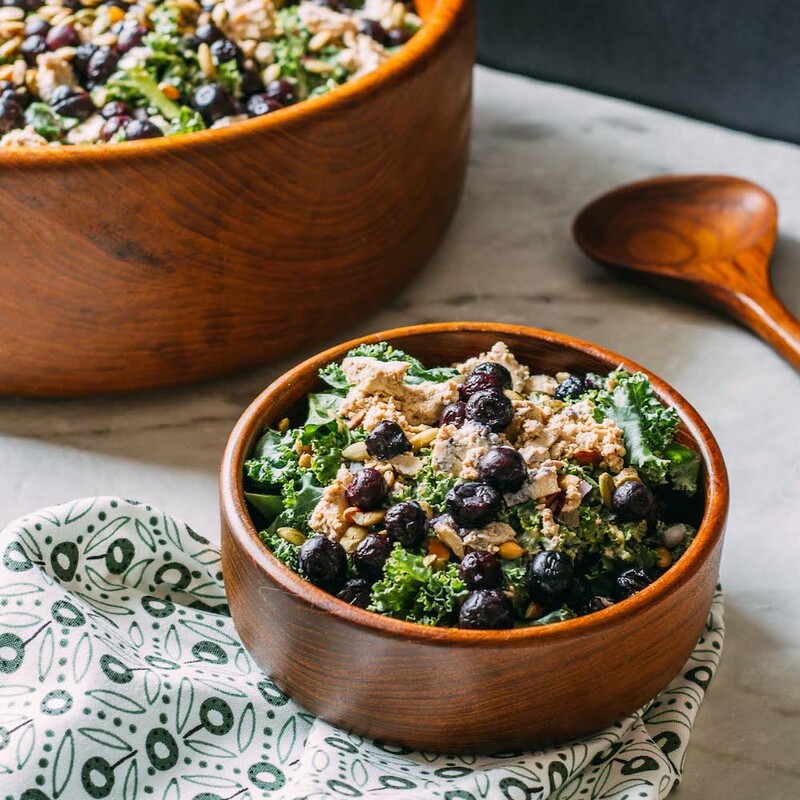 This salad tastes incredibly savory, and thanks to the hearty kale, marinated tofu, and pumpkin seeds, it’s loaded with satisfying plant-based protein! extra firm organic non-GMO tofu pressed to remove excess liquid - I've been using this simple press for years! 1 cup of fresh or thawed blueberries - Or, you can add even more berries... YUM! the juice of two fresh lemons, or about 1/2 cup - You could also use the juice from an orange or grapefruit. I often use grapefruit juice to switch it up & I love it! 3 tsp of miso - I LOVE this variety of miso! First, place the pressed tofu in a medium-size bowl after breaking or slicing the tofu into bite-size pieces. Pour the Braggs Liquid Aminos over the tofu chunks, stirring to coat, and set aside to marinate while you prepare the rest of the salad. Combine the citrus dressing ingredients in a blender and season with salt and pepper to taste. 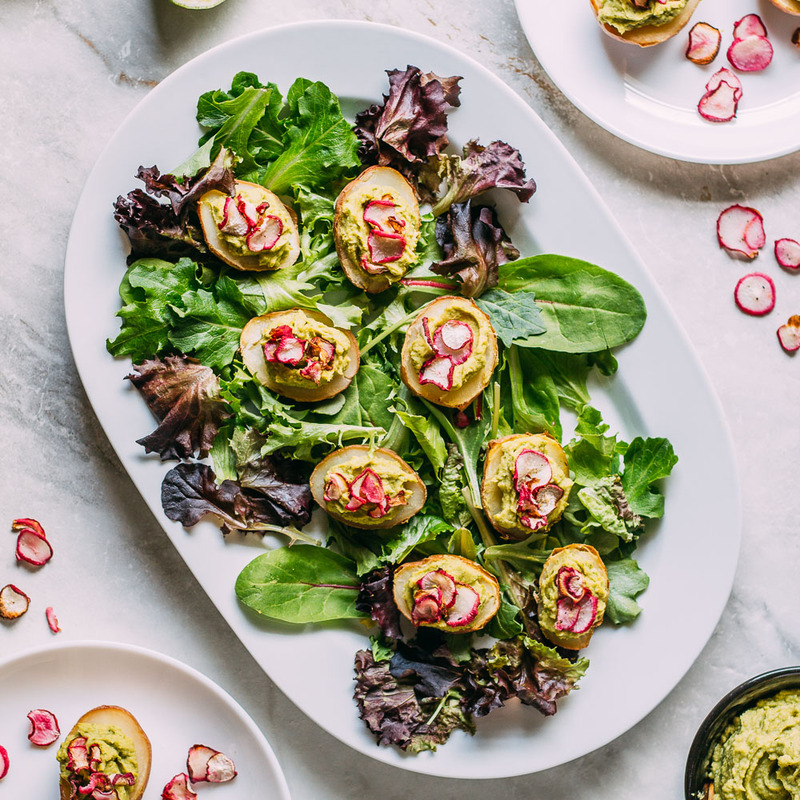 The dressing ingredients include the lemon juice, or alternative juice listed, garlic, tahini, one cup of the soaked raw cashews, apple cider vinegar, miso, salt, and pepper, to taste. In a medium-sized, warm, dry skillet, gently toast the pumpkin seeds. Observe the toasting and stir as needed. If you are using fresh kale leaves, wash the kale and chop into bite-sized pieces. Set aside the stems for juicing or another use. Place the chopped kale in a large salad or mixing bowl. 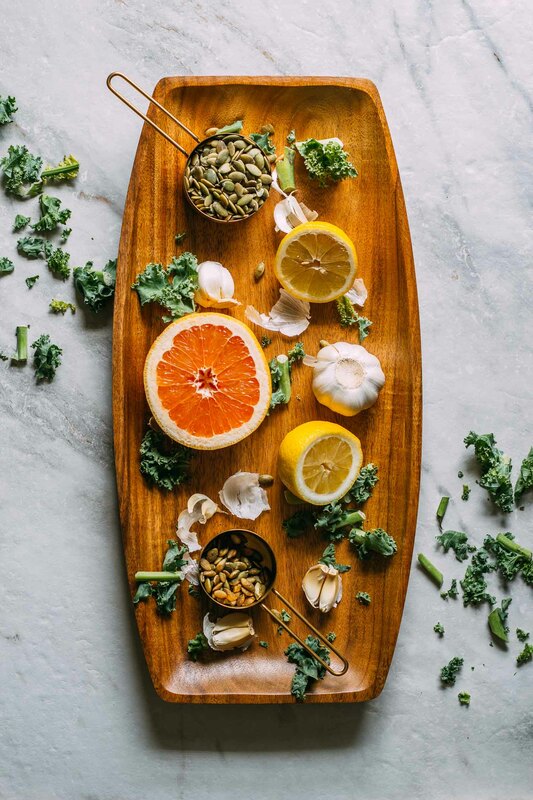 For added texture and color in the finished salad, set aside a fist or two of bite-sized pieces of kale to mix into the finished mixture at the end. Now, pour the prepared dressing over the kale in the mixing bowl. Massage the dressing into the kale using your lovely hands. Massaging the kale this way makes it softer to chew and easier to digest. Now, add the marinated tofu, red onions, blueberries, remaining 1/2 cup of soaked cashews, and the toasted pumpkin seeds to the dressed kale. Toss gently to distribute the ingredients evenly. And toss in the extra bit of undressed kale that you set aside at this time, too. Serve this gorgeous salad as a delicious meal in a bowl with a wedge of your favorite bread. 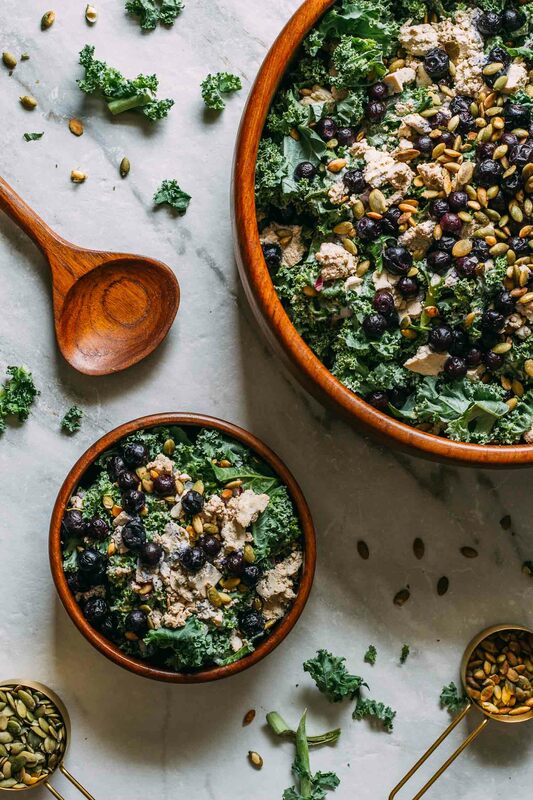 Blueberry Kale Pumpkin Seed Salad makes an ideal dish to bring to a cookout or another type of gathering and would look splendid as part of a festive holiday buffet. You can get this salad on the table super quick if you begin by pressing the liquid out of your tofu ahead to save time during dinner prep! Pressing the tofu typically takes from 10 to 20 minutes or so. If you like, you can press the tofu the night before, wrap it in a clean towel and keep it in the fridge overnight. That way, its ready to go at dinnertime! If you find yourself going through as many cashews as I do in your plant-based cooking, you might want to buy the cashews in bulk. For deliciously fresh, organic, raw cashews, purchasing four pounds at a time from this brand is the best deal I have found. I store them in the freezer... it keeps them super fresh.